I have a [new] favorite Christmas tradition: reading through Dickens’s A Christmas Carol on a chilly winter evening with mulled wine and dear friends. This was our second year to be invited to this reading, thanks to the Tallon family, and it was the highlight of my Advent season. Dickens has a way of making the eccentric loveable—from Betsey Trotwood to Mr. Fezziwig, we’re left with portraits of characters that are not only interesting but familiar. Likwise, the sometimes annoying characteristics of those around me (anyone from family to coworkers to friends to acquaintances) become instead endearing traits that make me love them just a little more. In short, Dickens encourages me to be a charitable reader of those around me. After reading A Christmas Carol again last week, I’d like to add Scrooge to the list of eccentric yet lovable characters. After all, he’s just a grumpy old man who says, “Bah! Humbug.” But Scrooge’s major flaw is not hatred or meanness or even greed. His flaw is that he is habitually locked into a particular—and self-centered—way of life. Scrooge is not evil. He’s stuck. In Stave One, Dickens points out Scrooge’s lonely inflexibility, “Scrooge took his melancholy dinner in his usual melancholy tavern.” He is a loner, pursues his own interests, and has done so for so long that he even declines a Christmas invitation from his very cheery nephew. But as the ghosts begin to appear, Scrooge’s expectations are entirely interrupted, so much so that his sense of time is displaced as he watches the clock tell time backwards. Suddenly, his habitual ways cannot be sustained, and he spends much of his evening waiting anxiously for the clock to strike one. This displacement of time, though, is what in part makes A Christmas Carol an Advent story—it is a story of waiting, preparing, and not quite knowing what to expect. Scrooge’s anxious glances at the clock, waiting for the next spirit, reminds me of my own longing not only for Christmas to arrive, but also not quite understanding just how Christ will be with me throughout this season and into the next year. Of course, the Scrooge of Stave Five is the one we fall in love with. The grumpy old man has become instead an excited yet shy, generous yet nervous celebrant of Christmas. His habitual, by-the-clock life has been interrupted and set aright by the Ghosts of Christmas Past, Christmas Present, and Christmas Yet to Come. Time, in the form of the ghosts, has been interrupted, revisited, and renewed. And that is my prayer for this Christmas season, especially since Advent has come to a close. I would not particularly like to see a ghost, but I would like for my old, self-centered habits to be disrupted by Immanuel, who humbled himself to enter our time and place in order to set everything aright. *raises glass* And so, as Tiny Tim observed, God bless Us, Every One! I hope no reader will suppose that “mere” Christianity is here put forward as an alternative to the creeds of the existing communions–as if a man could adopt it in preference to Congregationalism or Greek Orthodoxy or anything else. It is more like a hall out of which doors open into several rooms…It is in the rooms, not the hall, that there are fires and chairs and meals. The hall is a place to wait in, a place from which to try the various doors, not a place to live in. For that purpose the worst of the rooms (whichever that may be) is, I think, preferable. It is true that some people may find they have to wait in the hall for a considerable time, while others feel certain almost at once which door they must knock at…when you do get into the room you will find that the long wait has done some kind of good which you would not have had otherwise. But you must regard it as waiting, not as camping. You must keep on praying for light…And above all, you must be asking which door is the true one; not which pleases you best by its paint and paneling. When you have reached your own room, be kind to those who have chosen different doors and to those who are still in the hall. How delightful it is, after some time, that I have found a room that has become a home, that reinforces the liturgical practices that restored my faith, that provides a community in which to experience the Advent season like I never have before. The richness of language in the Book of Common Prayer–which, when not directly quoting Scripture, draws heavily on it–sustains my thoughts longer than I thought possible. I found the Anglican daily prayers before I entered the room of the Anglican church, and consequently “celebrated” Advent and the other liturgical seasons alone. Though this may have been necessary at the time, celebrating the season of Advent in community makes all the difference. From the Advent wreath that marks the passing of time, to the liturgical color of the season (for us, Advent is represented by a deep blue), to the Advent collect, to praying through the season with others, I have found a home which my conscience moves me towards. Whatever room you are in, I hope that you find yourself fully engaged in the traditions of your community this Christmas season. And if you find yourself in the hallway, perhaps this season of darkness, light, and new beginnings can provide clarity and hope as you wait. It’s finally here! A new year, a fresh start. This past Sunday was the first day of Advent, which is the first day of the liturgical calendar. And I find it more refreshing to celebrate Advent as my new year then the actual New Year: It marks the beginning of a story that will unfold (instead of a unwritten possibilities), it comes with habits and rhythms and suggested resolutions (instead of having to come up with them all on your own), and it gives you a community in which to live out these practices (instead of leaving it all up to you!). Advent is a season of waiting, hoping, and longing. It is characterized by the darkness of winter as we wait for the light to arrive in three distinct ways–the Jews waited for a Savior, we wait to celebrate His birth, and we also wait for Him to come again. And most importantly, it is a time of invitation. We are invited again to enter into the story of Christ while we invite Christ to bring light into the dark places in our lives. As you begin to walk through Advent–for the first or the 50th time–here are some suggested readings. Malcolm Guite is a British poet who is a master of the English language. Waiting on the Word is his anthology of seasonal poems from various authors for each day of Advent, Christmas and Epiphany. This is definitely my favorite book I’ve found on Advent! Highly recommended. Not sure what Advent is all about? Or the rest of the liturgical year, for that matter? This is a great place to start. Even if you are familiar with the liturgical year, this book will take you deeper into the ideas and practices that shape each season. The Seattle School is on the 5th year of this series, which comes straight to your inbox with reflections on Advent through prose, poetry, music, and art. Definitely one of the easiest ways to stay connected with the season! Dickens has the odd gift of teaching his readers how to love the oddest of people. I realized shortly after reading Dickens for an entire semester that my perception towards strangers and acquaintances and friends had become much more charitable. Not only is this a great reason to read one of his works, but this particular novel begins during Christmastime. It is a story of darkness and shadows, of hopes and expectations, of generosity and forgiveness. Obviously, everyone is reading A Christmas Carol this month (right? ), but if you’re looking for a longer work, this would be my recommendation. This week, I’m in Colorado with my students from The Covenant Preparatory School. We’ve been whitewater rafting, hiking, eating, fellowshipping, and sometimes sleeping! 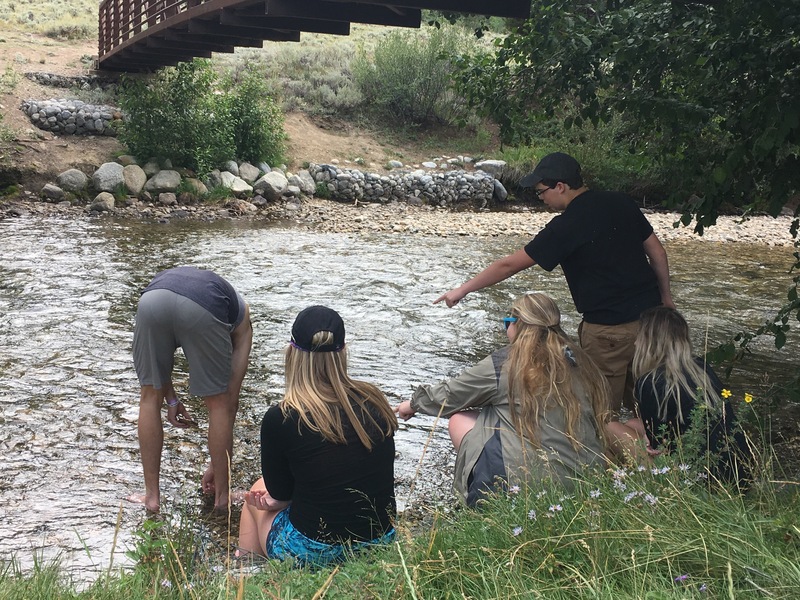 Initially, it seemed like an odd time to take a week-long trip; the students have only had classes for three days, then we headed north to Buena Vista. Classes will resume when we return, but teachers have already had to deal with the curriculum struggles that come with a week away from the classroom, right after school has begun. I’m quickly realizing, however, that this week is as much a part of my students’ education as sitting in the classroom discussing The Iliad. If I’m truly concerned with the whole person that I’m teaching, a week in Colorado should be considered an indispensable page of my lesson plans. As I was hiking with my seniors today, I noticed their reverence for God’s creation around them. I saw them encourage each other, become better listeners, and grow in their friendships. 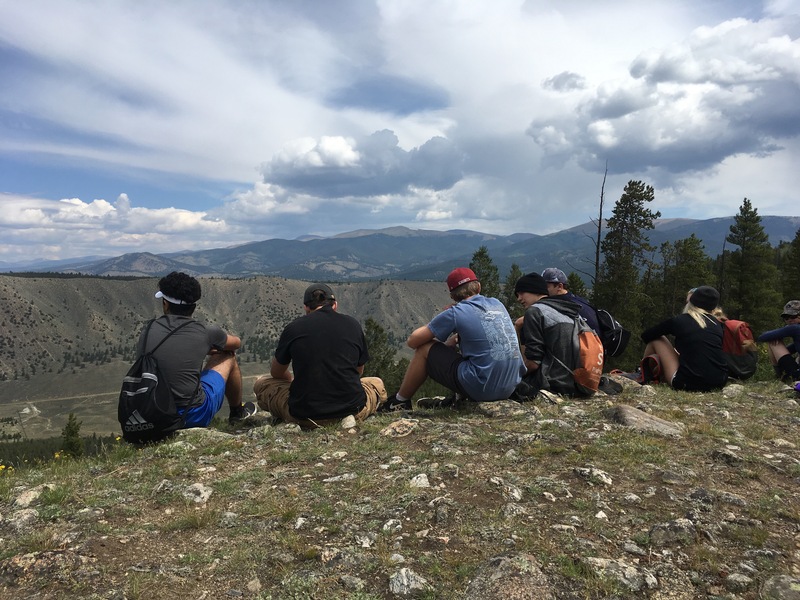 Most people consider trips such as these “bonding times.” And though that is a great benefit, the best thing about this particular trip is watching my students learn how to contemplate the beauty around them. They aren’t allowed to have any sort of device with them, so in these few unplugged days, they are learning how to see. I’m off to dinner! Happy Tuesday. School starts tomorrow. It is daunting, to say the least, but other teachers understand my mix of excitement and dread. This past weekend, however, made the looming school year look even more threatening on the horizon. The Charlottesville incident inspired posts and tweets about posterity, along the lines of “This will be in our history books…” and “How will I explain this to my child?” “What is my responsibility? What will I tell my children when they ask how I reacted?” All valuable questions… but my thoughts turned, of course, to students. In a Curriculum and Development class I took a couple of years ago, we discussed explicit and implicit curriculum. Though explicit curriculum choices often make it into the syllabus (for example, my freshmen are starting with The Iliad this week), the implicit curriculum are the values, learning environment, cultural assumptions, and practices that inform our explicit studies. And just as important is the null curriculum—that which we choose not to address. As I saw pictures of the protesters, watched the video of the car driving through the crowd, and read about the horrifying chants of the white nationalists, my gut reaction was probably similar to yours: “Is this America? In 2017?” But then I remembered human nature and history and realized that this is just a dot on a timeline, and humanity is tempted yet again by power and pride. Tower of Babel, anyone? We’ve always wanted to be our own gods, to claim our place among the nations. And then I looked more closely at the pictures. Many who marched look about my age. Many who marched look only a few years older than the seniors I’ll welcome to my class tomorrow. All of them had some sort of education. Some of them went to private school. Most of them probably read The Scarlet Letter, To Kill a Mockingbird, and Hamlet. All of them studied American history. In a few short years, my students will have to make the decision: Which march do I join? Which protest? What do I say? What do I post? Posterity is a concern of mine as well. Yes, one day I’ll tell the story to my children of the age of terrorism that we’re currently living in—my vivid memory of 9/11, the unending attacks in Europe, ISIS and the refugees trying to make their way to safety. But right now, my students are watching what I say in the classroom, my former students are watching what I post on Twitter, and we’re all living in a week of history. My fear is that issues like Charlottesville will become so commonplace that they become part of our null curriculum in the classroom—that which is not addressed. Not only does that take away from valuable discussion of what it means to live as a Christian in this country, and how Homer and Hawthorne and Augustine would react to such an event, but it communicates to my students that Charlottesville and similar issues are not worth being thought about deeply or discussed. Like the beginning of every school year, teachers everywhere are thinking about goals for their students. Which equations should they have memorized by the end of the year? Which literary devices should they know? How many research papers should they write? Should public speaking be a requirement? I’m there too, thinking about the number of pages a week, the books in a semester, the questions driving the entire year. But Charlottesville brought me back to the ultimate telos of education—the type of people my students are becoming. How are they being formed by my curriculum (the explicit, implicit, and null)? How will they react to the Charlottesville of their time? Perhaps I have a certain advantage, being a literature teacher. If I wanted to, I could discuss Achilles’ rage, whether or not it is justified, and even compare it to protesting in general. But whatever we teach, the implicit values and null curriculum often speak louder than the syllabus. This year, I’m beginning to realize the weight of my responsibility as a teacher. May my curriculum choices invite compassion, charity, and wisdom into the lives of my students. Welcome to my first flowchart Friday post! I’m putting aside my usual “What I’m Reading” series for the summer for something a bit more interesting. My first flowchart is about Dickens. If you talked to me last semester, or kept up with this blog, you know that I took an incredible Dickens graduate seminar this spring and fell in love with everything Dickens. Sure, his books are long, and he does spend a lot of time bashing the English legal system, but his fame is not without reason! Some compare his popularity and impact on the English culture with Shakespeare’s. Summer always seems glorious to me at the outset. When I was teaching full time, it meant days when I could read what I wanted, days without grading papers, days of sleeping past 5:45 a.m. Now that I’m a student, it means days of reading what I need to read for my own studies instead of classes, days not spent on campus, days free from responsibilities of essays and deadlines. And for most everyone else, even if they are not on an academic schedule, summer often means time off, traveling, a change in workload. But summer comes with its own troubles. As carefree as it may appear, the absence of routine and work can take its toll. In past Sabbath Tuesday posts, I’ve written about the beauty of work paired with rest—something Wendell Berry often explores in his poetry: “When we work well, A Sabbath mood/ Rests on our day, and finds it good.” So what happens to us, those whose lives are dictated by the academic calendar, whose work suddenly subsides for a few months? At the beginning of the summer, it is easy to think that the time off will be one long Sabbath after the difficult academic year. But there is a difference between a break and an intentional rest. Sabbath moments during the school year were a breath of fresh air in the midst of the heavy workload, but now, summer is just one long break. How I choose to spend my time can determine how much rest actually happens during these three months. The difference between a break and a rest reminds me of the difference between fast food and a well-prepared feast. Fast food (for those of us who like deep-fried things) is something we look forward to, something we crave. If you’re a Texan like me, you probably agree that summertime and Whataburger go hand-in-hand—it works for late nights, post-river trips, and after you’ve climbed up Enchanted Rock. And it tastes good. But we are aware that it is a quick fix that doesn’t contribute to our long term health or nourishment. At a cabin in North Carolina with good friends, feasting and resting. On the other hand, summer is also a time when hospitality blossoms. Cook outs and barbecues abound, extended families reunite, friendships deepen. The slowing down of work welcomes the thoughtfulness of day-long meal preparations before friends arrive. These kinds of meals—I mean the slow-cooked brisket, side of beans, watermelon salad, coleslaw, peach pie—have a different impact on both our bodies and souls than those quick Whataburger stops. They are deeply nourishing to both our relationships and our bodies. So far this summer, I’ve struggled with the idea of Sabbath, and I assume that some other academics have too. It is difficult to crave nourishment when you’re already in the midst of a break. Sabbath looses its attraction when work subsides, and the importance of rest and renewal and remembrance fades. This morning I was reading in Jeremiah about the house of Jacob that turned their back on the Lord. They were said to “go after worthlessness, and become worthless.” This is my greatest fear for the summer: that I’ll only eat Whataburger, go after worthlessness, merely “take a break,” and not be renewed when the school year starts again. May we pursue Sabbath and the nourishment it brings even in times of less work. Tubing on Lake Travis in Austin, TX with my little brother Austin.